What could be more glamorous than an unforgettable wedding in Cannes on the French Riviera? A wedding at sea could be a great romantic theme of your wedding. For your wedding, we offer VanDutch boat rentals. We can furnish several VanDutch boats to safely transfer you and your guests to your wedding reception. VanDutch Boat Rental for stag and hen parties: No stag or hen party would be complete without a memorable day on board a VanDutch. Start off with a day of celebration and rub shoulders with celebrities in Saint-Tropez. The beaches of Pampelonne, such as Nikki Beach, La Voile Rouge, Club55, Bora Bora and others, are well known for their buzzing and party atmosphere throughout the day. 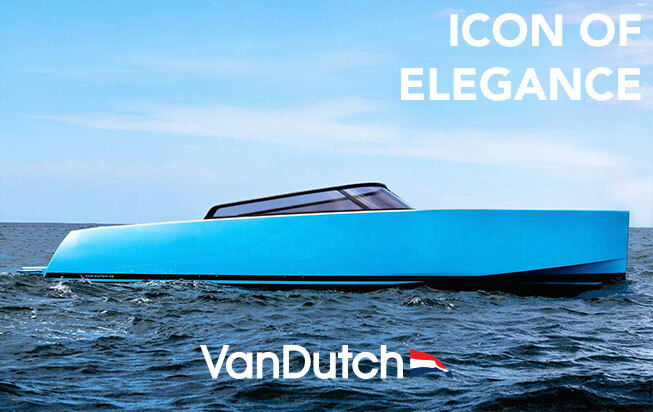 VanDutch Boat Rental for ferrying guests: On your wedding day, hire several VanDutch boats to ferry your guests or surprise them by arriving at the venue on board a comfortable VanDutch. Each year, we are pleased to be part of the wedding scene and take care of transferring the happy couple and their guests. In June 2012, one of our customers rented six VanDutch boats for a wedding on the Lerrins islands at Cannes. We ferried all his guests from the Hotel Majestic pontoon in Cannes to the La Guérite restaurant on St Marguerite island. A white VanDutch was also specially reserved just for the bride to take her to the Island in style. The wedding was absolutely perfect! VanDutch Boat Rental for your wedding anniversary: It is your wedding anniversary and you would like to celebrate it in a really unique way? Rent a VanDutch and discover the most stunning beaches in the region. Our captain will take you into natural and unique spots in the Bay of Cannes, Antibes, Monaco and Saint-Tropez.